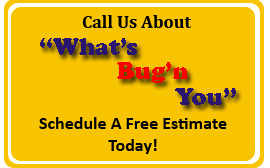 The first step in any kind of pest control management is to identify what pests you already have. 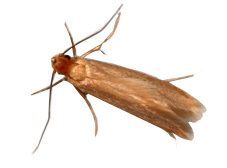 Many pests are not only annoying but can threaten you and the people around you. Understanding their biology, diets, habits, and habitats is important. 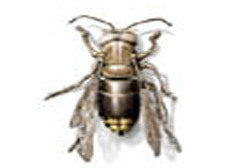 Anchor Pest Control will help you, identify your pest and provide effective ways to control them. Below is a list of the most common pests in the Northern California area and a picture to help you identify— What’s Bug’n You! Appearance: Typically, light to dark brown. Behavior: Nests are usually located in moist soil, next to or under buildings, along sidewalks or beneath boards. Argentine Ants travel in trails and create swarms. 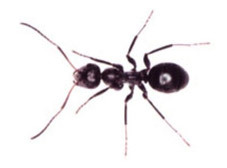 Threat: The Argentine Ant kills other insects, damages landscaping, and invades human dwellings. Appearance: Bed bugs are flat, reddish-brown, oval insects up to 4 to 5 mm long or the size of an apple seed. Swollen and reddish after a blood meal. Behavior: They prefer to be more active at night when the host is asleep. They feed on human blood and other warm-blooded hosts. They infest offices, stores, hotels, gyms and countless other places. Bed bugs can be found in cracks and crevices, including mattress seams, sheets, furniture, behind baseboards, electrical outlet plates and picture frames. Threat: Their bites can leave itchy welts on the skin and can cause allergic reactions, such as severe itching, though not everyone reacts to their bite. Appearance: Black and shiny. Identified by red hourglass marking on the underside of their abdomens. Behavior: Typically found in dark, secluded areas such as crevices and woodpiles. Threat: If bitten, extreme pain, cramping and nausea commonly occur. Pain, swelling and cramping can spread rapidly to the arms, legs, chest, back and abdomen. 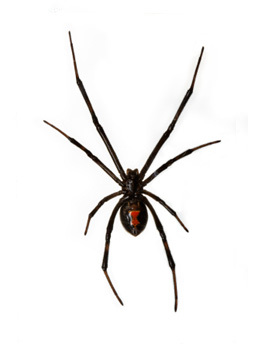 Delirium may occur, but the harm inflicted by the black widow spider is unlikely fatal. 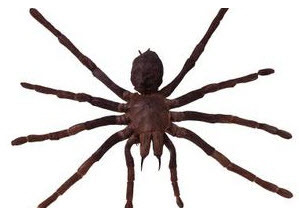 Behavior: Spin webs and dwell in dry, dark areas such as attics, basements, cellars, closets, crawlspaces and ductwork. Outside, they can be found under rocks, logs and lumber, as well as in barns, storage sheds and garages. They roam to catch prey. Therefore, they are often seen. Threat: Most bites become red and fade away, but in uncommon cases necrosis or tissue damage can occur. Appearance: Among the largest ants in the United States. The most common color is black, but some species have reddish or yellowish coloration. Behavior: Reside both outdoors and indoors in moist, decaying or hollow wood. They cut galleries into the wood grain to form their nests and provide passageways for movement. 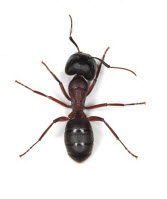 Threat: If treated early, carpenter ants are seldom responsible for serious structural damage to houses and buildings. However, these ants could cause extreme damage if they continue undiscovered for an extended period. Appearance: Rounded body with irregular pattern of white, brownish and yellowish patches formed by scales of different colors. Behavior: Adult beetles usually lay their eggs in air ducts, in closets, under furniture, or under baseboards. 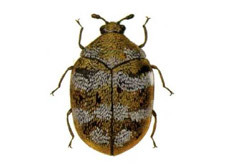 Threat: Carpet beetle larvae eat natural fibers and feathers. They often damage woolens and other fabrics. Appearance: Typically, moths have two pairs of wings covered in scales. Behavior: Prefer the cover of darkness and do not typically fly to lights. Typically, laying eggs attached to their preferred fabrics. Threat: Consumes wool, fur, silk and hair. If left untreated, infestations can decimate entire wardrobes, as well as the bedding and furniture of affected homes. Appearance: Size and appearance vary according to species. 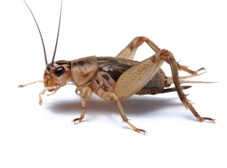 Most crickets have long thin antennae and large jumping hind legs. Behavior: Prefer damp moist conditions. Many are active at night, and some are attracted to lights. Threat: Some cricket species sing. These sounds can prove troublesome at night, when they often are loud enough to interrupt sleep. Appearance: Most noted for their pincers on the back of their abdomens. They often cluster together. 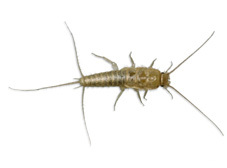 Behavior: Earwigs use these pincers for defense and for sparring with rival earwigs. 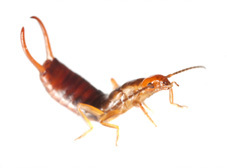 Earwigs can be found in areas where there is water—kitchens, bathrooms and laundries. 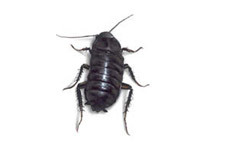 Earwigs can also find their way into bedrooms and family rooms. Threat: They can become a nuisance. They will be gathered under things like cushions that were left outside overnight. Some species produce a foul-smelling liquid that they use for defense. Earwigs frighten many people because of the pincers on the back of their abdomens. Appearance: Adults small, wingless and are covered in tiny spines with piercing mouthparts. Behavior: Adults are parasites that draw blood from a host. Commonly fleas are found on pets that repeatedly scratch and groom themselves. 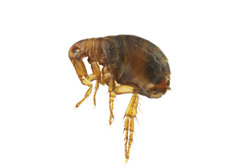 Threat: Pet discomfort of the flea activity as the adult fleas feed on the pet’s blood. People also may experience bites which leave behind itchy bite marks. Appearance: Light brown or tan coloration with two black horizontal stripes located behind the head. Behavior: Commonly found indoors, typically in kitchens and bathrooms, but can move to other areas of a home if food and moisture are available. Threat: German cockroaches are also known to secrete a number of odorous compounds. They are known for their ability to transmit a number of pathogens, including E. coli, Salmonella spp. and Typhus. Some studies show the development of asthma in children can be directly linked to the presence of German cockroaches. Appearance: Some hornets may have hair on their bodies. Behavior: Hornets primarily consume other insects, although some species are also attracted to human food, overripe fruit and meat. Hornet nests are composed of a paper substance derived from saliva and wood pulp. They are located within or atop trees, in attic rafters and in other covered areas. Threat: Hornets are a nuisance and are typically aggressive. Some individuals may be allergic to their sting. Appearance: Short hair that is light brown or gray to black in color, with lighter bellies. Behavior: Typically, makes its home in farm fields, grassy and wooded areas, building nests in areas that are dark and protected from the elements and close to a readily available food source. They reproduce very quickly. Threat: They are a nuisance, their urine is odorous, they destroy property, and are known to carry disease. Behavior: Often found nesting in the walls or beneath the floor. They are most likely to invade buildings during rainy weather. Odorous ants travel in trails. Threat: Can contaminate human food supplies. Appearance: Shiny black to a dark reddish-brown color. Behavior: Their natural habitat is outdoors, but they may infest homes. Most outdoor populations can be found living beneath the mulch in landscape beds, in leaf litter, beneath stones or debris outdoors. 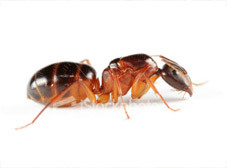 If access is available, the insects can thrive in the voids or openings beneath porches, in wall voids and crawlspaces. 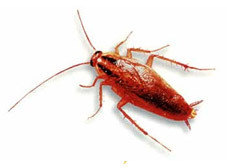 Threat: Oriental cockroaches can be a source for many food-borne pathogens, including E.coli, Salmonella spp., and other pathogens. Appearance: Covered in fur that is black, brown or gray in color. The ears and tail are covered in scales. Behavior: Nests inside and under buildings, or in piles of rubbish or wood. 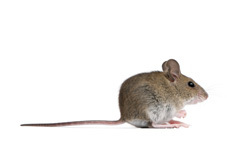 Within a year, one female may be responsible for up to 40 new rodents. 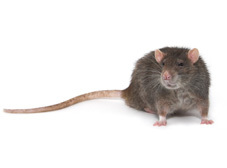 Threat: Rats can be carriers of diseases. They can transmit these diseases through physical contact, bites, by contamination or by fleas that are feeding on the rodent. Appearance: Two body segments – an extended body and a segmented, erectile tail, which ends with the stinger. Threat: The sting can contain venom. No scorpion venom in the U.S., with one exception, is viewed as a significant medical threat to the average person. Venom may cause swelling at the site of the sting, numbness, convulsions and difficulty breathing. 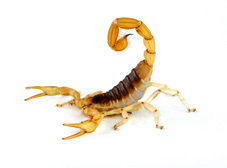 People who are allergic are more likely to die from a dangerous scorpion’s venom. Appearance: White to brown-grey or bluish-silver in color. Behavior: Dwell in dark, damp areas such as basements, attics, kitchens and bathrooms. Feed on carbohydrates, particularly sugars and starches. Cellulose, shampoos, glue in books, linen, silk and dead insects may be food sources. Threat: Their destructive feeding habits, oftentimes ruining papers, clothing, wallpaper and contaminating food. Appearance: Subterannean Termites are creamy brown in color, are long, narrow, oval in shape and live in colonies. Their hard, saw-toothed jaws work like shears and are able to bite off extremely small fragments of wood, one piece at a time. Behavior: They live underground, from which they build tunnels in search of food; able to reach food above the ground level by building mud tubes. They are dependent on moisture for survival. Their diet consists of wood and other cellulose material. 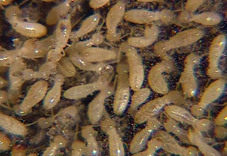 Threat: Subterranean termites have the ability to consume wood at a rapid rate. They can infest a wide variety of structures and can damage and/or kill trees. Subterranean termites are a destructive species. They can collapse a building entirely. Appearance: Wolf spiders may measure 9 to 35 mm in body length. They are most commonly brown in color, with various marks and stripes over the body. Behavior: Wolf spiders move quickly and can reach a speed of two feet per second over short distances. They often carry their young in the sac on their back. 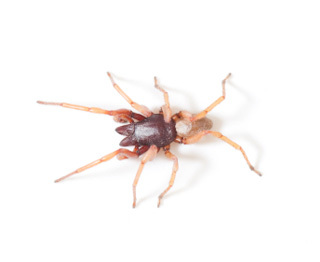 Threat: A wolf spider bite is not a significant medical threat to the average adult. Wolf spiders typically do not bite unless threatened or provoked. A bite from a wolf spider may result in swelling, pain and itching.